A pair of first half goals were enough for Drury to get past the visiting Panther’s today. 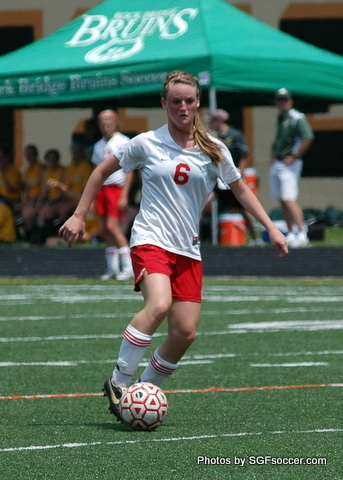 The game-winner was scored by Alyssa Alcorn (video below) in the 21st minute when she headed Hilary Cockrell’s corner kick just over the goalkeeper for her first goal of the season. Katie Pritchard (Waynesville) scored the second goal when she beat the keeper to a ball on the edge of the six yard box and tapped it in. Allcorn scored at the 20:37 mark with a header off a Hillary Cockrell corner kick for a 1-0 advantage, then struck again at 35:24 when sophomore Katie Pritchard scored from three yards out off assists by junior Nicole Williams and freshman Kara Steiner. Senior keeper Jessie Sanderson picked up her fifth shutout of the season and school-record 35th of her career in goal for the Panthers, who out-shot Kentucky Wesleyan (2-10, 1-10 in the GLVC) by an 11-4 margin. Drury, which improved to 6-6-1 overall and 4-5-1 in the GLVC, will hit the road next weekend for league matches at Indianapolis on Friday and Northern Kentucky on Sunday. A penalty kick, in the 77th min, was all that separated these two teams today. Kara Steiner drew the call and Hillary Cockrell converted the kick. The Panthers moved to 5-4 overall and 3-3 in GLVC play with the victory, while S & T fell to 3-3 and 3-3. It was Cockrell’s first goal of the season and sixth of her career, in addition to being her fifth game-winner at DU in her three seasons with the Panthers. Senior keeper Jessie Sanderson posted her third shutout of the season and school-record 33rd of her career, picking up four saves along the way for the Panthers, who outshot the Lady Miners 10-8. The Lady Miners dominated the opening period as they outshot the Panthers 8-3 in the frame and put four of those shots on goal. Unfortunately S&T was unable to put one in the net. The second half was all Drury as it dominated the stat sheet getting off seven shots, three on goal and had three corner kicks. 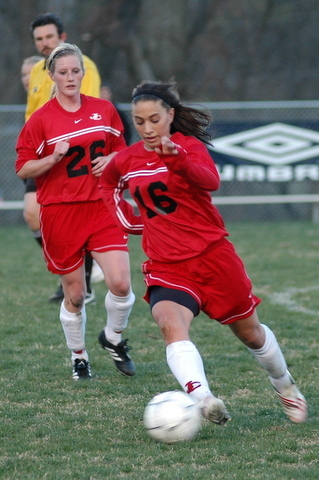 Hillary Cockrell scored the game winner. Drury hits the GLVC road next weekend for matches at Southern Indiana on Friday and Missouri-St. Louis on Sunday. With junior Nicole Williams leading the way, Drury scored three goals in a 13-minute span late in the first half to break it open for a 5-0 Great Lakes Valley Conference victory over Maryville Friday afternoon at Harrison Stadium. The Panthers (4-4 overall, 2-3 in the GLVC) went on top just two minutes into the match on Williams’ goal off a Katie Pritchard assist for the 1-0 advantage. The Missouri S&T Lady Miners gave up two goals in the first four minutes of the game and were never able to recover dropping a 3-0 contest to Quincy on Sunday, September 19th in Rolla. The loss snapped S&T’s three match winning streak. The Panther’s lost to Quincy 0-1 at Quincy the previous week. The Lady Miners are now 3-2 overall and 3-2 in the GLVC. Regional players include Melissa Young, a junior midfielder from Jefferson City Helias who has started all five games and has a pair of assists. 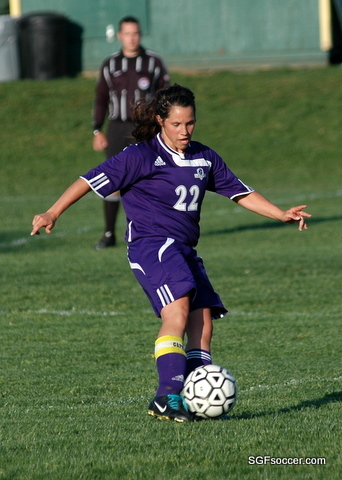 Freshman Jaclyn Standfast (Rolla/Metro Strikers) has played in all five games and has one goal, a game winner scored against Illinois-Springfield. The only goal in the road game evened the Miner’s record at 1-1 on September 10th. Tiffany Laughlin is headed to Missouri State in the Fall along with Brooke Williams, Liberty and Katie Kujawa, Cor Jesu. Kara Steiner from Jefferson City is headed for Drury. Note: Both Steiner and Shouse are headed for Drury in the Fall where they will play for Coach Alf Bilbao and the Panthers. The Laker’s high powered offense took down the Tiger’s tonight. Eight different girls scored in the contest as the Lady Lakers took a 4-0 lead at the half and scored 6 more in the second. The Liberators, coming of their win in the Willard Invitational Tournament, won on their visit to Springfield. From the News-Tribune: The Lady Bulldogs, who are in the Lady Jays’ district, had blanked seven straight opponents before Kara Steiner’s score in the first 10 minutes of the game snapped that streak. Kinsey Shouse assisted on the goal. After Rolla (10-5-1) tied it midway through the half, Jefferson City got the game-winner with less than three minutes to go before intermission. Abbey Rhea tallied the score, assisted by Jade Connor.